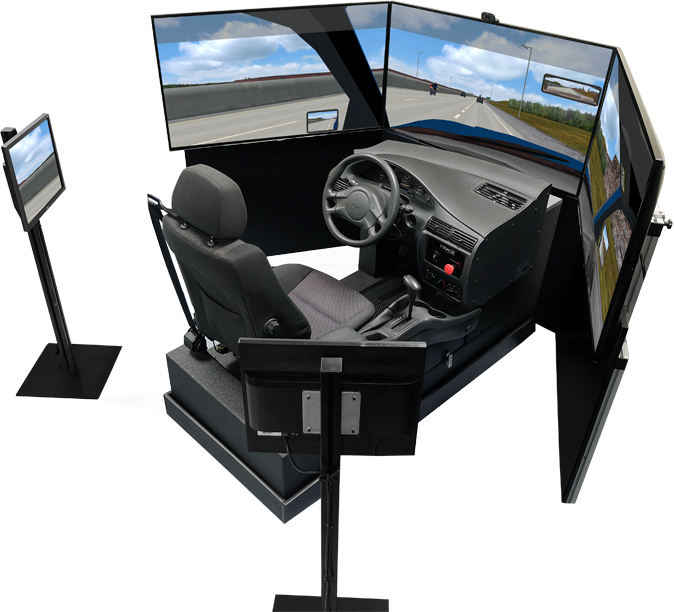 Virage Simulation provides a cost-effective car driving simulator system with a realistic environment for educational and research activities. Our car driving simulator is built with the most advanced simulation software available in the industry using a sophisticated driver environment built with actual car components providing a realistic feel of all controls. The VS500M car driving simulator is a high fidelity fully immersive driving simulator providing the best blend of quality, functionality and cost. High quality graphics, 3D sound with a high fidelity motion provides an ideal simulated driving experience in a real car cockpit environment without the real-world consequences should the student driver make a mistake. Our training curriculum library allows progressive driver training from beginners to experts. The car driving curriculum has been approved by government authorities as a replacement for a portion of the in-car driving course provided by driving schools. It’s the ideal solution for your driver training or research needs. 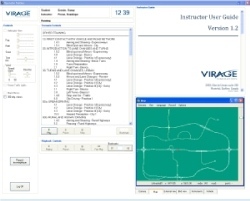 Virage Simulation offers all the services and support required to realize your projects. We have expertise in scenario creation for driver education and driver evaluation from novice to experienced driver. Research is part of our daily activities being involved in a multitude of projects. We can help you build the environment to validate your hypothesis. The Virage Simulation VS500M car driving simulator system consists of an open cabin with the driver seat and center console of a GM compact car, a fully functional instrument and warning light cluster, a wide visual display and a three-axis motion / vibration system. Automatic and manual transmissions are available, including an optional conversion kit allowing quick and easy changes. The steering wheel is connected to a dynamic electrical load unit allowing for the simulation of the force felt on the steering wheel during the turning maneuvers and feedback from the road surface such as holes, road shoulder or even rolling over a sidewalk. The visual optical system consists of a five-channel PC-based image generator and three 55” LCD displays that provide 180 degrees front view. Two side screens provide additional visual feedback for the left and right blind zones. 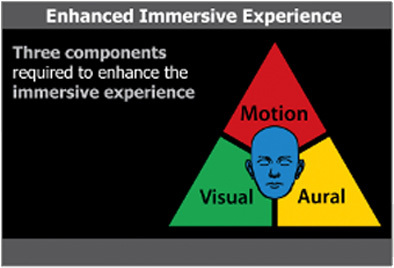 The high-resolution system generates 1920 x 1080 pixels per front display, as well as antialiasing and anisotropic filtering for high quality, stable real time rendering. Rear view and side view mirrors are simulated through a window inset within the main screen. A rear display is available as an option to perform parallel parking or other activities requiring rear view. Thanks to our cooperation with AutoSim, a full set of visual scenes reproduces city, highway, industrial, farmland and mountainous environments. Winter scenes, rural roads and various atmospheric conditions are available and can be used within the scenarios to recreate different driving conditions. 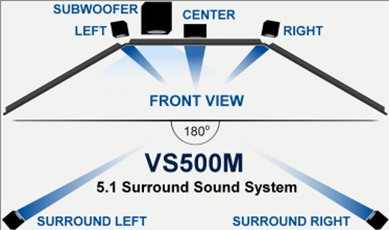 The VS500M car simulator comes equipped with a high fidelity 5.1 surround sound providing realistic directional sound cues correlated with road conditions, engine RPM and speed. Additional realism is provided by sounds from other vehicles, including the simulation of the Doppler Effect. The motion / vibration system consists of a compact three-axis platform with electric actuators. The system provides acceleration cues, engine vibration and road texture feedback as a function of the car speed and road surface. Motion cues at a frequency up to 100 Hz are achieved. Comprehensive Learning: The simulator training scenarios cover basic driver training, evaluation and advanced training under different road, traffic and weather conditions. Lessons and objective evaluations can be performed with or without an instructor. Scenario design is based on proven pedagogical principles. Special attention is given to shifting and advanced training such as energy efficient driving and hazard perception. Training Control: The car driving simulator operator station is an easy-to-use system providing comprehensive control of the simulator learning environment. It will allow the most novice to the most expert instructor to complete his or her training sessions in a very efficient and productive manner. Student and instructor management functions enable the operators to organize and monitor the training activities according to the organization’s already existing driver-training management system.